At first, the film’s dark humor is amusing, only for it to wear off once an actual plot kicks into motion. God (Benoît Poelvoorde) is a chauvinistic pig with an appetite for schadenfreude in director Jaco Van Dormael’s fantastical comedy The Brand New Testament. He lives with his submissive wife (Yolande Moreau) and his feisty 10-year-old daughter, Ea (Pili Groyne), in a three-bedroom Brussels apartment from where he plans out humanity’s tragedies, crafting versions of murphy’s law just to screw with people’s minds. God, for instance, may decide on a whim that everyone needs to get 10 extra minutes of sleep every day, just so people will become frustrated in the morning, or ensure that your telephone will ring the minute you start taking a bath. Sick of God’s abusive behavior toward humanity and herself (he whips her with his belt when she misbehaves), Ea decides to strip him of his credibility: She logs on to his computer and sends a panic-producing text message to everyone on Earth stating the exact amount of time they have left to live, a crisis that’s labeled “Deathgate” by the media. And in a Pan’s Labyrinth-like move, Ea escapes God’s wrath through the family washing machine, arriving in the real world to witness the terror produced by said wrath firsthand. At first, the film’s dark humor is amusing, only for it to wear off once an actual plot kicks into motion. While there’s something pleasurable in the portrayal of God as a pathetic macho in decline, a la Al Bundy, surrounded by old card-filing cabinets where the dusty history log of everyone’s lives presumably lives, The Brand New Testament is too intent on alternating its comedy with a sense of gravitas that feels canned and overtly sentimental. 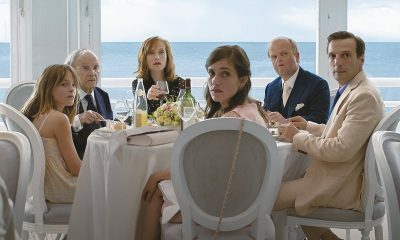 It’s as if Van Dormael felt too guilty over his blasphemous concept to commit to it unabashedly, or find satisfaction in simply surveying this irreverent parallel world that he and co-screenwriter Thomas Gunzig created without having to explicitly ask, and answer, larger questions about the meaning of life. A subplot that gets little traction is Jesus’s whereabouts. We learn that J.C. escaped the family at some point, seeking refuge from his father by pretending to be a statue of himself, only coming to life in front of Ea. The question of a world predetermined by computer code controlled by one single man hovers over the film but remains largely unexplored. Or rather, it’s explored as an excuse for narrative action, not for its allegorical potential. Once God realizes that Ea has wreaked havoc by rewriting his computerized orders, he takes the portal to the real world through the washing machine and ends up getting a taste of the very poisons he’s produced, such as being a victim of violence, hunger, and the need for identity papers which he cannot produce. Yet God’s plight feels like an afterthought in a film bent on fabricating sadness and depth through Schubert melodies and little else.